Welcome to April 2017 Curious Tea subscriptions! We have some new and exciting teas to share with you this month. As usual we have tasted and selected four fantastic teas for you to try. Huang Shan Yun Wu from the famous Yellow Mountain region of China’s Anhui Province is a crisp and light tea that is very drinkable. The second light tea, Ding Gu Da Fang, comes from the same region but is processed rather differently, resulting in a deeper, nuttier taste. For the darker side of the selection, we opted for a particularly smooth Assam tea from Bhartia Tea Estate located in the famous Dibrugarh District. 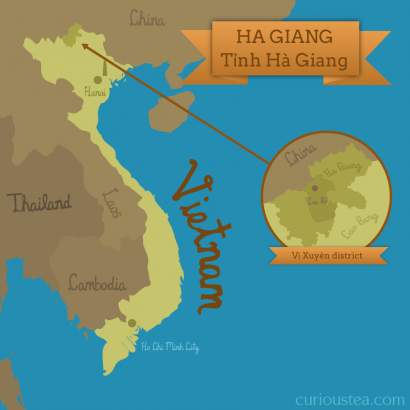 And finally we have a really unusual and quite complex dark tea form Vietnam that is processed similarly to a ripe pu-erh that has a deep woody and earthy character. Mixed: Huang Shan Yun Wu and Assam Brahmaputra Black. To help you along with the tasting, here is some further information on all teas featured in our April boxes. Huang Shan Yun Wu (黃山雲霧) green tea is a clean and tangy green tea from the Yellow Mountain (Huang Shan) tea growing region of Anhui Province. The name translates as ‘Yellow Mountain’ (Huang Shan 黃山) ‘Cloud and Mist’ (Yun Wu 雲霧). It is seen by Chinese tea experts as a kind of predecessor to the famous Huang Shan Mao Feng green tea and is known for its dense flavour, bright look, fragrance and clear liquor. 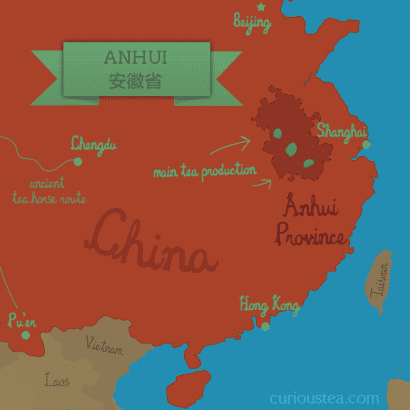 Huang Shan not only happens to be a popular tourist destination in China but is also an ideal location for tea growing. The cool and misty climate as well as mineral rich soil combine to produce flavoursome teas that have a high level of theanine and are rich in tannins and vitamins. There is an interesting point to note on the origin and meaning of the ‘Cloud and Mist’ name of this tea. The name comes from description of the mountainous regions that have large amount of clouds and mist around and therefore high humidity – areas that are perfect for tea farming. In China the name ‘Yun Wu’ (雲霧) is somewhat common and is often used in many regions throughout the country to describe a green tea that is produced locally but that does not fall under any of the ‘famous’ tea types or has any other modern branding attached to it. Generally, it is a good quality local green tea that has been hand plucked but then machine processed in order to keep the costs reasonable. These teas do vary in quality and taste depending on the growing region and processing but tend to be somewhere in the middle. So while Huang Shan Mao Feng is firmly in the famous tea category and only specific teas can be sold under that name, Huang Shan Yun Wu can refer to a wider variety of green teas from this region. 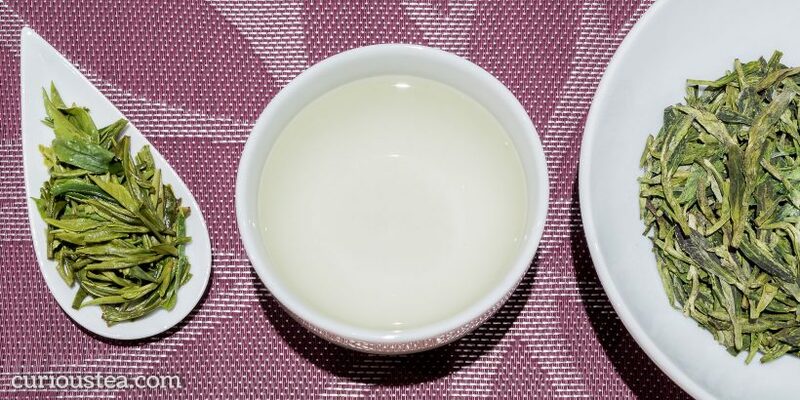 A great aspect of well chosen Yun Wu teas is that they exhibit many of the qualities of their much more expensive famous counterparts from a particular growing region. But the less labour intensive processing as well as not having a famous name attached results in much more reasonable pricing and a great quality to cost ratio for our customers. The small, tightly twisted buds of this Huang Shan Yun Wu have a gentle fresh green and almost candy-like fragrance. The brewed liquor has a very light champagne colour and a clean, slightly grassy and vegetal aroma. The light processing results in a taste that is crisp, tangy and light, with a sweet and slightly corny aftertaste. There is no astringency and very little dryness in this tea, but there are notes that are reminiscent of blackcurrant leaves, with a fresh and sharp presence. The resulting cup is refreshing and easily drinkable. We suggest brewing at 80°C for 2-3 minutes according to your taste. It can be brewed 3 or more times depending on your taste preferences. You can also buy Huang Shan Yun Wu green tea in our online shop. Ding Gu Da Fang (頂谷大方) is a classic green tea, also from Huang Shan (Yellow Mountain) area of Anhui province in China. The tea is named after its creator, a Buddhist monk – Da Fang, who lived at the top of a mountain called Lao Zhu Feng during the late Song Dynasty. According to legend he personally grew and harvested this tea and served it to visiting scholars. As the tea quickly gained reputation, many people wanted to come and taste it so the monk shared the tea with the local farmers. As they prospered from this tea, they named the tea in honour of the monk: Ding Gu (Valley Peak) Da Fang. This tea grew so much in popularity that it was once one of the top ten teas of China, and is still considered to be a famous tea according to some lists. 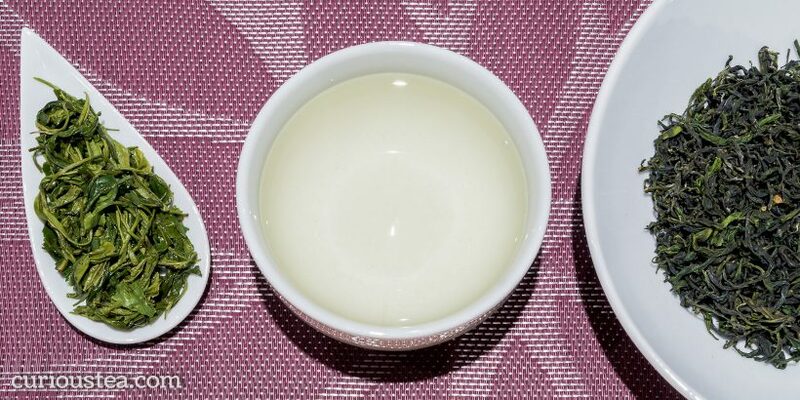 In appearance, Ding Gu Da Fang green tea resembles another very popular Chinese tea, Long Jing Dragon Well. In fact it is thought by some that Ding Gu Da Fang is the predecessor of Long Jing tea. If you compare the leaves of the two teas side by side, you can certainly see the resemblance in the shape of the leaves due to similar processing employed. This Ding Gu Da Fang green tea has very flat green leaves that open up when brewed. You can see that it is made exclusively from buds plus 2 small leaves. The liquor has a light green colour with a sweet nutty and vegetal aroma. This tea has no dryness or astringency with a long lasting and deep taste. There are sweet notes of corn, fruits and almonds. Definitely a more complex cup that should be savoured to appreciate the nuances from each infusion. It is best brewed at 80°C for 2-3 minutes and the leaves should be re-infused around 3 times. You can also buy Ding Gu Da Fang green tea in our online shop. Assam Brahmaputra Black is another intriguing tea from the Bhartia tea estate in the east of Assam. We previously featured the smoky Assam Brahmaputra Green and this month’s black is equally delicious. Named after the Brahmaputra river which flows through Assam state, this tea comes from a garden where it is produced in cooperation with other nearby small farm holders and is made completely by hand. It was harvested in October 2016, using the local Camellia sinensis var. assamica cultivar. This Assam Brahmaputra Black tea comes from a part of Assam that is located close to the border with Arunachal Pradesh state. 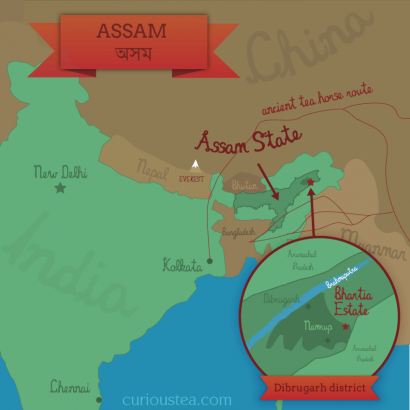 It is within the Dibrugarh belt that is often referred to as the ‘Tea Capital of the World’ due to the large amount of tea produced in the area. This area is of course particularly famous for a typical Assam style of tea that has brisk and malty flavours with an appealing liquor appearance. 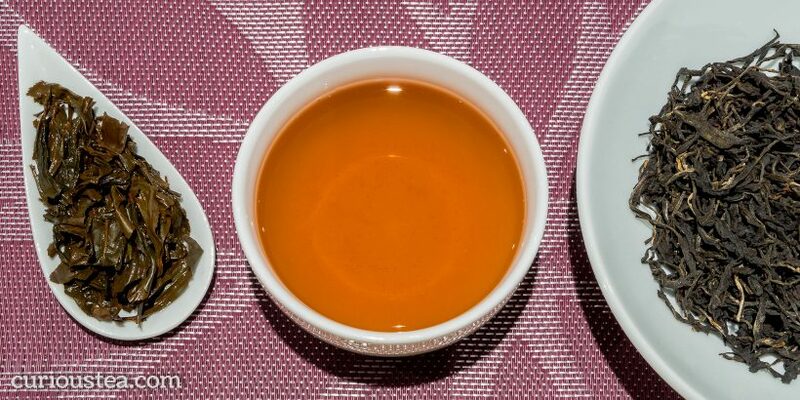 This black tea certainly exhibits those qualities yet is well above most large scale commercial productions of the area both in quality and taste. Bhartia tea estate is also located close to local areas of natural beauty, including the Dihing Patkai virgin rain forest, known as ‘the Amazon of the East’ due to its climate and biodiversity. Traditionally a small holder farm like this one would supply tea at very low prices to larger factories for further processing, which in turn would sell their finished tea at auctions to highest bidders. However, market pressure on tea prices as well as increasing local costs make such traditional methods of selling tea unsustainable for many farmers in the longer term. This is the primary reason why some smaller farmers are switching to producing high quality handmade tea that is distributed in a more direct chain to end consumers. This ensures that the farmers and the workers on the farms are paid a fair amount for their tea as it does cut out many of the middlemen present in traditional tea supply chains. We work directly with the owners of Bhartia tea estate, whose family have owned the estate for over a century. Although they produce only a limited quantity of this tea due to labour intensive hand processing, the quality of it really is quite superb. This hand made Assam Brahmaputra Black tea exhibits a more complex character and particular smoothness that is the direct result of hand processing as well as care and skill that has been employed while making this tea. This Assam Brahmaputra Black tea has been hand selected and hand rolled in the traditional orthodox style of tea production. The large dry twisted leaves have a dark brown appearance with some golden tips and a malty aroma. When brewed, the aroma of this tea is an unmistakable malty Assam with an added caramel dimension. It is quite light for an Assam, so if you’re not a fan of strong teas, this may suit your taste rather well. It could be compared to a top grade english breakfast blend but is not drying on the tongue and can be easily enjoyed without milk. The red amber liquor has no astringency, but is sweet and smooth and has a caramel undertone with a slight earthy depth. Very balanced and perfect for a gentle morning tea. We suggest brewing at 90°C for 3-4 minutes according to your taste. It can be brewed a couple of times depending on your taste preferences. You can also buy Assam Brahmaputra Black black tea in our online shop. Cao Bo Dark Forest is a complex dark tea from northern Vietnam, located just across the border from Yunnan Province of China. A dark tea category is one that is akin in processing to a pu-erh. While only dark teas from Yunnan can be called pu-erh, we choose to label teas that undergo similar processing but are from other regions as ‘dark teas’ in order to avoid any confusion. This Cao Bo Dark Forest tea is gathered from wild ancient Camellia sinensis var. Assamica trees growing in the area of Cao Bo mountain in Ha Giang province at an altitude of around 1,400m. It is gathered by members of the Dao people, an ethnic minority both in Vietnam and China, with significant numbers in Yunnan Province of China. Following old tea processing methods, the leaves of this tea are processed similarly to a green tea but are then allowed to age through a process of post-fermnetation. This processed is similar to that of a ripe pu-erh – it ages the tea and develops the flavour over many years. The organic leaves of this tea have been left loose rather than being pressed into cakes, speeding up the ageing process. This particular batch was made from leaves that were picked in 2007 so it has been allowed to age for 10 years. This has resulted in a complex flavour that has developed over this time that makes this tea quite unique and may be a little challenging for some tea drinkers. While this tea can be somewhat of an acquired taste, we think it is still an exciting and quite different tea to get to know! Cao Bo Dark Forest is definitely a complex tea that has a very distinctive flavour. The loose leaves are jet black in colour once submerged in water and produce an amber liquor with a characterful woody aroma. The taste has a long finish with earthy and woody notes reminiscent of walnuts. Some people compare the taste to a damp earthy forest, hence the ‘Dark Forest’ name. While having an acquired taste, this tea is highly beneficial for digestion and would be often enjoyed as part of a meal in this region. So try it with a meal, especially one that features very rich food. Also make sure to re-infuse the leaves as many times as you like as the flavours on dark teas do change a great deal with each infusion! We suggest brewing at 95°C for 2-4 minutes according to your taste. It should be brewed 3 or more times as each infusion brings out quite different aspects of this complex tea. You can also buy Cao Bo Dark Forest dark tea in our online shop. We really hope that you enjoy the tea club selection for April and are looking forward to what we have in store for your May boxes! This entry was posted in Monthly boxes and tagged Assam, black tea, China, Dark tea, green tea, Vietnam on April 19, 2017 by Curious Tea.